IanBru wrote: Some interesting rotation from Los Pumas. What noticeable is the number of players from those wretched performances in June who have retained their spots in the XV, or at worst been dropped to the bench. A major lack of experience at tighthead could be helpful for us. Excellent use of Excel there Bru. I'm very impressed. 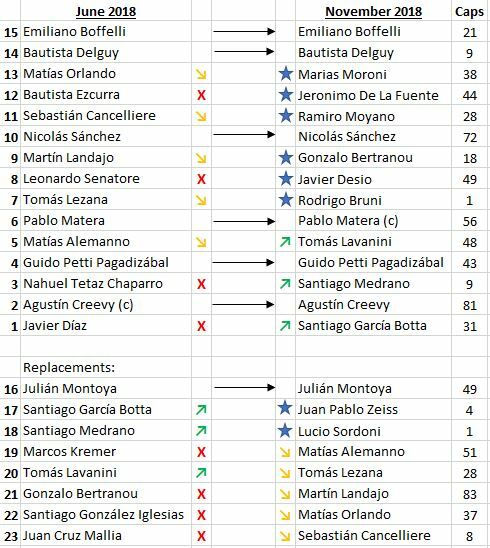 Next do a pie chart of the starting XV showing those called Jeronimo De La Fuente and those who are not please. Looks damp and gloomy - could be a slippery ball. RDW_Scotland wrote: Looks damp and gloomy - could be a slippery ball. That’s what I said admin boy. Key stat to see we're 9th out of the top 10 in terms of turnovers differential - need Barclay back! Gaaaaaah why take quick 22s they never work!!! On a different day we could be playing with 12 or 13 men on the park at the moment. FFS they need a rocket. Playing at a snails pace, and continuous muppetry. Think I might go paint the fence, this is awful stuff. First time I've noticed Russell's playing! We need G Horne and Dunbar on. Laidlaw and Russell need to go back to France. RDW_Scotland wrote: First time I've noticed Russell's playing! You must have missed his awful up and under earlier, lucky you! Conditions are poor but so us our kicking. We’re putting up high balls and no one contesting. When they put a high ball up we’re struggling to catch it. If we’re going to kick, send it long and make it go into touch. This is where we see if toonie is paying attention. Wee Horne needs to be on by the 50th min. Russell needs binned right now with Dunbar coming on. Thank Christ that’s over. One of the worst half’s of rugby I’ve ever seen. One for the purists as they say. As RDW says, this is not the day for the Russell/Hastings axis. Dunbar needs to come on at 12 and run hard and straight at them. I think Brian Moore was spot on - if we carry on like this there's a good chance Argentina will win as this suits them better. We need to go back to what we know - we need to up the tempo noting that the weather makes it even higher risk. Argentina have noticeably run out of steam after 60 mins in the last couple of games. Weather looks better - time to go full mental jacket! BigGee wrote: Argentina have noticeably run out of steam after 60 mins in the last couple of games. Ritchie has played well all round. Yay. Wilson is on. Now we’ll get go forward ball. It's alright lads - Wilson is on! This game should have been perfect for strauss but he's not done much. In fairness to the lad he's getting nothing to work with. Dreadful pass from Wilson to JG. When have we EVER seen JG knock on twice in a game? Don't think I remember more than 1 ever. Can we have the real JG back please? Hastings has looked good out wider. Should we have played him at 12 with Russell at 10??? We’ve really regressed this AI series. They're killing us at the breakdown. We need Dunbar and McInally on. Fraser Brown must be knackered, he's been everywhere. It's good that Toonie has experimented, but he needs to make sure that he doesn't repeat the bad ones. Anglobraveheart wrote: They're killing us at the breakdown. We need Dunbar and McInally on. And just like that it is so. What are the lottery numbers? Hogg showing his class again, the guy would walk into any international team in the world. FFS a professional rugby team should never not be back 10 at a lineout!